There have been two important speeches at the National Press Club in the past week or so. One of them got bucket loads of media coverage and has turned into a national story of gargantuan significance. EM covered it here. The second NPC speech received some coverage, but there have been few ripples across the pond and the story has died. However, EM can’t let it go because it is a subject dear to our heart — Freedom of the Press. Just two days after Two Punch delivered his wooden and self-wounding speech on Monday, perhaps fatally injuring his own prime ministership and his political party in the process, the chair of the Australian Press Council, Professor Julian Disney, gave an address to the gathered scribes and interested onlookers. Disney’s speech won’t kill off the Press Council, but he is leaving soon anyway and his replacement has been announced, Professor David Weisbrot; so, in some ways, the address was a valedictory. Disney also used the speech to make some thinly-veiled comments about the role of destabilisation and undermining of the Council’s authority by Rupert Murdoch’s NewsCorpse. Julian Disney’s Press Club speech and the coverage it received in the news media make an interesting case study. As you might expect, these set-piece speeches are usually pretty safe; not much is said that hasn’t been said before and no grenades are chucked. 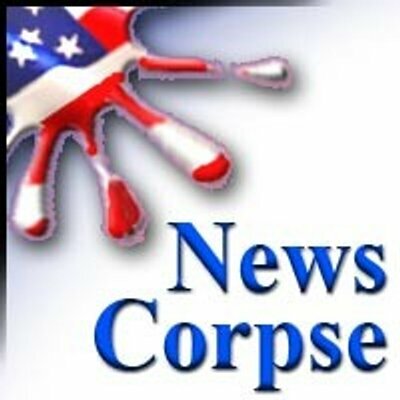 Though, the Crikey scribe thought maybe one or two were lobbed at NewsCorpse. Julian Disney did not set the Twittersphere alight like Tony did, but there was enough meat on the bones for his comments to attract a bit of coverage. 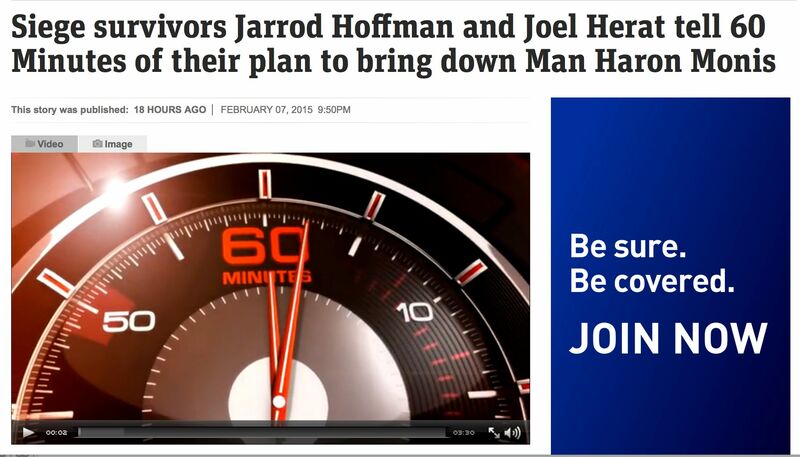 As might be expected, cash-strapped Fairfax “covered” the speech by reproducing an edited transcript. Rather a waste of space really, because anyone who was remotely interested in reading it for themselves could do what I did and download it from the Press Council website. In fact, a quick comparison shows that the Fairfax “extract” of Disney’s speech is just the last page out of eight. The other seven pages have just disappeared into the memory hole. The ABC’s coverage, based on an interview Disney did with The World Today, is much better. The news angle is that media diversity depends on more digital players and a better business model to support small online-only publishers. “I do think over time [digital outlets are] the main hope for diversity, and without diversity we don’t have real freedom of speech,” Professor Disney told The World Today. Nick Grimm’s piece also picked up on Disney’s comments that the APC is now accepting memberships from digital-only publishers, such as The New Daily and New Matilda alongside Crikey and Mumbrella. Melbourne University’s student journalism publication, The Citizen, has also joined and other university news sites may follow suit. Mumbrella‘s coverage focused on the digital aspects of the speech and also Disney’s comments that the APC should perhaps work more closely with the broadcast regulator ACMA to bring regulation into the age of convergence. This is unlikely to go down well with the free speech fundamentalists at NewsCorpose whose libertarian IPA-inflected free market orthodoxy hates the idea of public (ie government) regulation of their profit making schemes. Disney also made some comments about the need to respect privacy, particularly in relation to the harvesting of content from individuals’ social media pages, such as Facebook, by circumventing their privacy settings. Writing on The Conversation, media academic Denis Muller argues that this has been a priority for Disney. He also notes that it became a much bigger issue in the reportage of the Lindt Cafe siege in Sydney. The Press Council has been pushing for sometime for the right to initiate its own investigations even where there is no public complaint. As Muller argues, the Lindt Cafe siege may have strengthened its hand. There was a strong case to do this in the aftermath of the Lindt Café siege in Sydney in December 2014. Among some otherwise excellent media coverage, there were some serious breaches of privacy, exemplified by the exploitation of people’s Facebook content. I have been a long-time critic of the practice of lifting material from private Facebook accounts without permission. I consider that it is theft — breach of copyright — and also highly unethical. Unfortunately, in the pursuit of a cheap story angle, most journalists will do it without thinking when told to be an unscrupulous editor. Just because we can, doesn’t mean we should. It is one of the many examples of what I call the “ethico-legal paradox” and the “techno-legal time-gap“. These are not just theoretical issues, but important questions about journalistic practice in the digital age. I have written extensively about this here, here and here. Julian Disney has needed an exceptionally thick skin to last for as long as he has as chair of the Press Council. 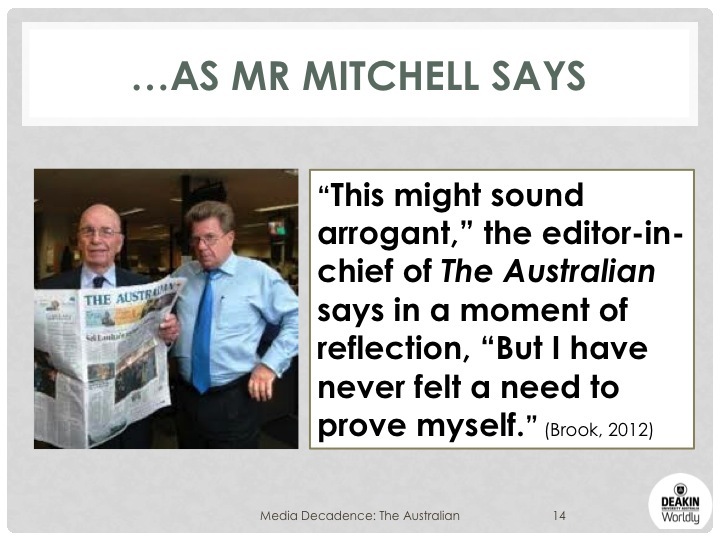 His tenure has been dogged by the sniping, snapping and barking of News Corporation; in particular he has incurred the wrath of The Australian and its larger-than-life editor-in-chief Chris Mitchell. Mitchell has had Disney in his sights for a long time and has taken every opportunity to range mortar fire down onto the Press Council while simultaneously retaining a seat at the APC table through News’ membership. I didn’t know this when I wrote the headline for this piece (honestly), the Murdoch papers have taken to calling the Press Council “Disneyland”. I came across the reference only while researching this post, but I was not surprised to read about it here. To be fair to Dennis Shanahan, the word “Disneyland” only appears in the headline, so was inserted by a sub-editor of their own volition or following a suggestion from higher up the food chain. So perhaps we can’t take it as gospel that it is the view of Chris Mitchell either, but it is consistent with the way that The Australian has treated both the APC and Julian Disney for the past two or more years. The fight got quite personal in August last year when The Australian became enraged about a Press Council adjudication it was not happy about; a fairly trivial matter involving its food critic’s comments about kangaroo meat on a restaurant menu. [Yes, that’s the trivia that gets these kool-aid slurping, once reasonable, columnists upset]. As a popular (with journalists), oft-quoted chairman of the Australian Council of Social Service, Disney was once the nation’s conscience; as the chair of the APC, he has become its chief press auditor, if not its top censor. Call me crazy, but I’d strongly argue most readers appreciate that’s how the media works. But Disney appears to think readers need to be hand held and protected from Big Media, the very media his council ought to be championing, according to it own charter. OK, so “Big Media” needs protection now from its critical audiences? This is the real “Disneyland” thinking, coloured by a suspense of disbelief and an overly-generous dollop of ego. The APC yesterday received a letter from The Australian’s lawyers that raised concerns over the conduct of a meeting of the APC’s adjudication panel this week which considered a complaint concerning coverage of the communist links of late Labor minister Arthur Gietzelt. I won’t go into this story, you can read about it for yourself if you’re interested. All I want to point out here is that these stories (and many others like them) highlight the self-interest and self-indulgence of The Australian under Chris Mitchell’s leadership. 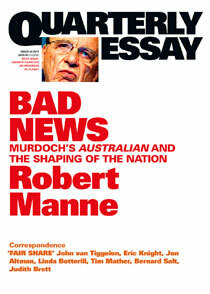 As Robert Manne and others have pointed out, The Australian has a reputation for being a bully and going after its critics, as indeed do other NewsCorpse titles. Like Robert Manne, I have been on the receiving end of this attention myself and it is never fun to know you are the one these thugs are coming for. One aspect of Peter Fray’s piece that I do want to comment on is the blurring of fact and opinion in the pages of The Australian. I am writing a major academic piece on this at the moment, which I will publish later this year; what I am discovering is that there is a process of what I call “factualisation” taking place in The Australian‘s news pages. The process of factualisation begins with a contestable proposition, which is really no more than an opinion, or at least something unverified in the usual journalistic way (by checking with other sources, for example) and it ends with the opinion being embedded in the narrative in such a way that it becomes hard to argue against in subsequent versions. Often stories contain statements of opinion that claim to have a factual basis. Political debate is rife with it. It’s a matter of informed debate, for instance, whether Joe Hockey is a good Treasurer, but based on his statements about poor people and driving, there’s been plenty of news reporting saying he’s had a bad week and isn’t up for the job (even if he has said sorry). Is that a fact? Isn’t what he said about poor people and driving actually a fact? Yes, according to the stats, but that’s a sidebar to the reported news. As you can see, it’s difficult. Yes, it is difficult, but if the starting position (and I would argue it is at The Australian) is that you source the facts to fit the angle on the story you want to run than you will inevitably end up with the “facts” you need. Secondly, if you repeat assertion and opinion often enough and cross-reference this to other pieces in the paper (on the same day or subsequently) then you can eventually turn even the most ludicrous proposition into a “fact”. The Australian is guilty of this on a daily basis; particularly when it wants to create a set of “facts” with which to prosecute a vendetta against its critics and enemies. Does Professor Disney read Ethical Martini? I live in hope that one day this blog will make me rich — if I could retire on the proceeds of Google AdSense or subscriptions to my paywalled blog — ah, dream on Marty! But I do wonder who reads Ethical Martini; I have no way of knowing unless someone tells me. However, I can’t help wondering if perhaps Julian or his speech-writer is occasionally dipping into some of my more relevant posts. When I downloaded and read Disney’s speech (you should too, to make sure you are not misled by my reporting or that of others), I was pleased to note that he has picked up on my factualisation theme. Click here for the speech text. Indisputable errors or misrepresentations are too common. A perceived need to beat competitors does not justify inadequate checking of facts, especially because, as I have mentioned, it is often impossible to fully rectify the impact of errors – even if corrected online within minutes. rather than the perspectives of the relevant journalist and article. News reports are too often distorted by writers’ opinions, especially through the use of loaded language (is a person a ‘freedom fighter” or a “terrorist”?) or by omission of key facts. Some prominent columnists can adeptly express strong opinions in ways which are highly likely to be read as indisputable facts yet are indisputably inaccurate or misleading. Some publishers are very reluctant to correct significant errors promptly, clearly and prominently. Digital-only publishers may tend to be more willing to do so than newspapers. But the rush to publish first, even if by only a few seconds, can make them more prone to error. Yes! Thanks Professor for the endorsement. The reason my attention wandered in this direction (and at last dear patient reader, the point of this long monologue) was reading The Australian‘s front page coverage of Julian Disney’s 4 February speech, written by Legal Affairs editor, Chris Merritt under the headline: Government leaks ‘kill freedom’. (It’s paywalled so Google it). 2 it highlights the theme of “Exclusive or Excusive” that I have been banging on about for some time. PRESS Council chairman Julian Disney believes the repeated publication of exclusive reports on government policy amounts to a threat to press freedom. Professor Disney yesterday used one of his final pubic appearances in the role to warn that leaks and exclusive reports could be having a “chilling effect” on press freedom. What? Does Julian Disney believe that leaks and newspapers cooperating with whistle blowers amount to an attack on press freedom? That could easily be the take-out from this statement; until that is you actually read the context of the remarks Disney actually made in the speech. What Disney actually said is that the selective soft leaking of stories to sympathetic publications by senior Government officials (often Ministers) “ahead of [giving it] to other media and the general public” could have “chilling effects” on press freedom. You can see that this is not the spin (rinse and repeat) that Merritt put on the comments at all. – a publication’s financial difficulties making it especially vulnerable to demands for favourable coverage in return for advertising or other support. So you see, there is no ambiguity here; Disney was clearly referring to the practice of “Exclusive or Excusive” and the main culprit (the only one under the Abbott regime) is The Australian. An “exclusive” in the newspaper world was always something that a reporter could be proud of and that an editor would get juicy over because it had the potential to increase sales and generate ‘buzz’ about the paper and the story. For a journalist, an exclusive meant free drinks at the bar, a pat on the back and a chance of promotion. But, today at The Australian the EXCLUSIVE has become devalued to the point of worthlessness and over-used to the point of terminal boredom and cynicism on the part of the reader. More disturbingly it has morphed into what I am calling the EXCUSIVE, a story that provides political cover and excuses for the actions of the Abbott government. 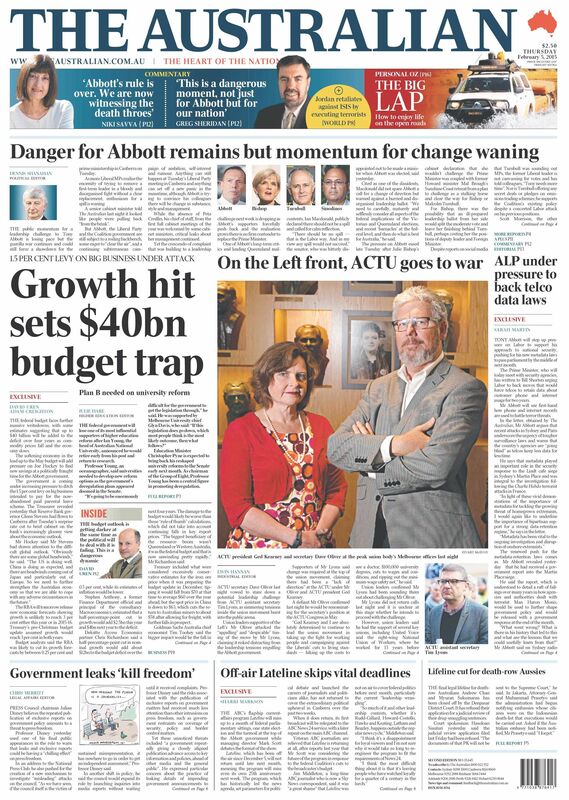 The Australian is now a mouthpiece and a megaphone for pro-Abbott propaganda. Let’s leave aside for the moment the exquisite joy of seeing NewsCorpse columnists and leader writers swinging in the breeze under conflicting instructions from Rupert Murdoch about how they should deal with Abbott’s self-inflicted leadership crisis, and focus instead on this “excusive” idea. You can check it for yourself, just spend $2.30 on a copy of The Australian on any day and read it in conjunction with reading this post and my earlier pieces on on the “excusive”. It won’t take you long to find copious examples. I’ll leave you with two from last week. Tony Abbott will step up pressure on Labor to support his approach to national security, pushing for his new metadata laws to pass parliament by the middle of next month. Two elements of the EXCUSIVE here: first the story appears before the meeting “today” and Abbott has written to Shorten. How do we know about this? Because somone in Abbott’s office has given Sarah Martin the story [more probably she was assigned to write it by whomever is assiged to collect these “stories” from the PM’s staff]. There are several long quotes from the letter and also quotes from an interview the previous day on Sydney radio station 2GB. In a little over 600 words across pages 1 & 4, there is no room for a comment from Bill Shorten. This confirms Disney’s point about no right of reply in the EXCUSIVE. All the classic elements of the “excusive” are there. We may even have seen the letter before Bill Shorten. The second example also from 5 February is even more egregious in its excusiveness. Headlined Growth hit sets $40bn budget trap and under the bylines of David Uren and Adam Creighton, the “exclusive” nature of this report is hard to fathom. That is unless you read between the lines and twig to the “fact” that the paper has been given access to a report from the Reserve Bank of Australia that is yet to be released. The rest of the story is based on interviews with easily accessible commentators, so what’s so exclusive about it? I would argue that it helped to relegate the leadership story to the second or third lead and therefore to downplay its significance. The headline on Dennis Shanahan’s piece supports this view and, in light of subsequent events, seems more like wishful thinking than accurate analysis: Danger for Abbott remains but momentum for change waning. Yeah, Dennis, not your best effort is it? I am going to leave the final word to Julian Disney, given he is leaving the APC at the end of this month, he’s unlikely to make another appearance on EM (at least in his current role). So long Julian and thanks for the fish. The APC boss has been heavily criticised by News Corp’s Australian newspaper, which dubbed him the ‘Censor in Chief’ and accused him of bias. “It’s certainly not a job for the faint-hearted,” he said. “Print and online media are under very significant competitive and commercial pressures and that obviously can increase the temperature. “There’s probably not much point in me trying to disagree with the comments they make, except that I would say quite firmly that there hasn’t been the slightest element of political bias in what we’ve done in my time and one only has to look at the adjudications to see that. This entry was posted on Sunday, February 8th, 2015 at 4:04 pm and is filed under Celebrities, freedom of speech, journalism, journalism in the digital age, Whores and Losers. You can follow any responses to this entry through the RSS 2.0 feed. You can leave a response, or trackback from your own site.